At the Family Issue Store at Ras Tanura, Saudi Arabia, an American woman, wife of an Aramco employee, pushes her cart into the vegetable section. Before her, on clean, refrigerated display counters, are many of the vegetables she might shop for in a supermarket back in the United States - tomatoes, carrots, lettuce, radishes, cucumbers, turnips, pumpkins, to name only a few. But what catches the housewife's eye is the sparkling moisture of freshness that characterizes the produce. And sparkle it should, for in many cases, picking, cleaning, packaging, and delivery to the store are completed in one day. In short, produce that was growing in the fields in the a.m. appears on the family table in the p.m.
Secret of all this variety and speed is not in the use of jet-propelled cargo planes from distant points but in the ever-growing productivity of the local farms. 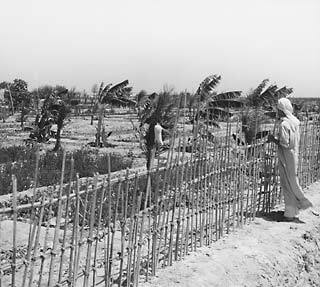 During 1959, farmers of the Qatif and Hofuf oases, nearby the oil operations area along the Persian Gulf, sold 380,000 pounds of fresh vegetables to Aramco for its retail outlets and dining halls. Aramco people were not alone in benefiting. Another 270,000 pounds went on sale in public markets in towns and villages. And in 1960 prospects for both farmers and consumers were even brighter; Aramco contracted to buy 580,000 pounds of produce, while local markets are buying in much greater volume than last year to meet public demands. As a matter of fact, where last year Aramco bought 60 per cent of the local produce and the neighborhood vendors, 40 percent, this year, with the public appetite thoroughly whetted for fresh vegetables, the ratio is exactly reversed. Oddly enough, the Eastern Province’s new horn-of-plenty is a second-coming. Years ago farmers drew bountiful harvests of produce and dates from the soil; then, when soil conditions changed, the land lay fallow and harvests became sporadic and small. Thus it is with a quite sense of thanksgiving the Saudi Arab citizens and Aramco personnel watch the land’s potential once again being realized. Dr. Grover Brown, head of the agricultural division of the Aramco Arab Development Department, sums up that potential when he says, "Something can be planted and something harvested every month of the year." Hofuf and Qatif farmers are doing just that. And all this from an area that once was confined mostly to tomatoes, onions, eggplant, okra, melons and squash. Now there are vegetables in the local suqs, in constant demand, that up to a short time ago no one had ever seen before. Getting the land started back to its old productivity didn't: happen by chance. It took some doing by Saudi Arab farmers, .the Saudi Arab Government and Aramco, but the results have justified the efforts. A ride out into the 10,000-acre Qatif oasis tells the whole story of the land's regeneration. At first glance, visitors are struck by what seems to be an abundance of water for a supposedly arid land. Acre upon acre of swampland. But nothing grows except marshgrass and weeds. Spotted here and there are the withered palms of a stricken date grove. This, where farmlands once flourished. Grover Brown puts his finger on the crux of the problem when he points to the white splotches and streaks on the levees of what once were irrigation ditches. "That," he explained, "is salt. It's what caused all this. You can irrigate with salty water, but you must have drainage. These people didn't. The land is waterlogged - salt-waterlogged." Once, water was scarce. Farmers had to dig each well - or 'ain - by hand. Then, also by hand, they dug surface channels and tunnels to guide the irrigation water to date gardens and crop fields. When water was that hard to get, the farmers cherished it. No one wasted water. But a little over two decades ago, men came into the Eastern Province with drilling rigs. They drilled for water, as well as oil. The oasis farmers saw and were delighted. The old struggle for irrigation water was over. However, what at first seemed a blessing soon revealed its disadvantages. With water so easy to get, farmers asked themselves several natural questions: Why worry about water and guard its use? Why use valves to control the wells? Why bother if the irrigation ditch levees break? Why not let the water flow prodigally over the land? Flow it did - and with the water, its salt. If the oases dwellers didn't worry, their Government did, and it hammered on the theme of conservation. But unfortunately, the water was over the dam, or rather, over the oases. The soil rebelled and crops suffered. Back in the summer of 1955, Aramco tackled the salty-soil problem as part of an agriculture program under its Arab Development Department. After engineers reported that drainage was practicable, Brown prepared a report for the Saudi Arab Government. The report proposed the reclamation of 9,000 acres at a cost of several million riyah (one riyal is about 22 cents). But the bright side of the coin was that the boost in farm production, over 20 years, would be 70 times the cost of the project. The Saudi Arab Ministry of Agriculture agreed with the report, and, in due course, funds were authorized. The first of four sections of the reclamation area is scheduled for completion this fall, and within six years the entire job should be finished. Then the swamp areas that visitors see today will be growing more than marshgrass and weeds. With seeds provided by Aramco, Brown and company went out into the Qatif oasis and "borrowed" a little piece of land here, another little piece there. Only experimentation would provide the answers they sought. What will grow in salty soil under a hot sun? What about insects and plant diseases? Will the farmers grow crops they've never seen - cabbage, cauliflower, head lettuce? Can their produce meet market standards? Matter of fact, will there he a market? From trial and error and trial again, the answers came in. Some crops grew; others failed. Almost every insect and plant malady imaginable had to be dealt with. And the farmers, yes, they were willing to grow those strange, new vegetables - or willing to try, at least - if someone would buy them. Best of all, Brown's team found crops that could be planted - and thus harvested - all year around. The team went out to the farmers and showed them, by actual demonstration, what could be accomplished. Seed, fertilizer, two small tractors, a few push cultivators and hand tools were made available. Since then, crop production has steadily increased. An important factor in the increase is the parallel demonstration work in irrigation and drainage done by the Saudi Arab Ministry of Agriculture, as well as their regional offices where farmers can seek advice. Brown's division works constantly with the Ministry on new measures for agricultural progress, recent examples being studies and publications on insect and disease control and improved methods for growing and marketing dates. All of these efforts lay behind the resurgence of crops in the Eastern Province. Everyone benefits - the American housewife who can choose among some twenty fresh vegetables at an Aramco store and the Saudi Arab housewife who finds the same selection at her favorite market; farmers, of course are enthusiastic about the upward swing in agricultural income. And with the new diversification of crops, everyone enjoys a more varied diet. Grover Brown is among the most enthusiastic and proud of what has been accomplished. But he is adamant on one very important point. "The credit belongs to the farmers, themselves," he says. "We started with a handful of them - the ones we believed would do the best job, planting the new crops and using modern methods. Our hope was that others would take notice and follow suit. That's just what happened."